Almost every morning at work (at about 920 AM) you will find me in the pantry area playing barista, trying to craft the perfect coffee brew from a less than perfect coffee machine. The “CAPPUCINO” button does a half-decent job of frothing up the machine’s creamer… but too much of it and it starts to overwhelm with that pasty-powdery dairy taste. The shot of espresso dished out following the creamer cycle starts off strong, but soon weakens into a dilute, stale americano. My German colleague often chuckles as he watches me pull the cup away intermittently at precise intervals to avoid water-logging my drink, finally topping up with fresh milk, splenda (don’t laugh) and an extra spoon of Kenco. But enough about my failed barista aspirations. I’ve found what has to be the Mona Lisa of all coffees just minutes down the road from my place. 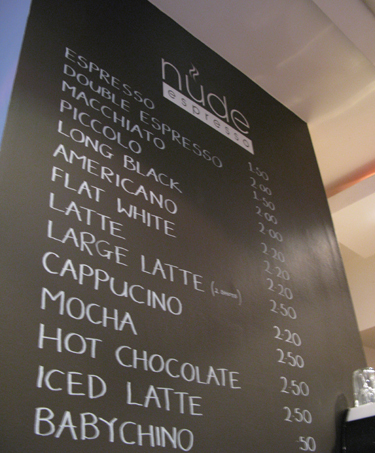 NudeEspresso sits on Hanbury Street, sandwiched between the hustle-bustle of Spitalfields market and BrickLane. They take the art of making coffee pretty seriously here and boy do they know how to make one heck of a flat-white. Absolutely beautiful isn’t it. I’ve never seen such perfectly formed, symmetric tulip-rings from the steam milk finish before. It looked so gorgeous, I found it difficult to work up the courage to add sugar at risk of ruining the work of art yet alone drink it. But when you finally dare to sip this remarkable cup of coffee, what greets you is a smoothe, foamy rich, sumptuous elixir that is bold yet perfectly balanced. Puts my daily coffee pursuits in the pantry to shame. A great cuppa coffee and for me, the best I’ve tasted in London to date. ooh that looks awesome guan. 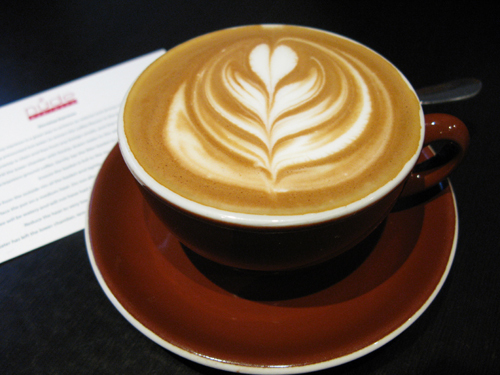 i have yet to try an amazing mind boggling cup of coffee yet – anywhere. Annabel, it is a seriously smoothe cup of coffee I tell you! Are you still in the states? When are you back in London? We should catch up when/if you are back in town over a cuppa.